High Frequency Welding Machine is one of our main products and our HF welding machines are mainly designed for conveyor belt cleats, sidewalls and tracking guides welding. 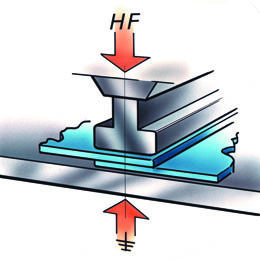 High Frequency welding is often abbreviated as HF welding or RF (radio frequency) welding, which is a manufacturing process to weld materials (such as PVC, PU, EVA, Polyester, polypropylene as well as composite materials with a sufficiently high percentage of HF-reactive materials) together within an electromagnetic field by supplying HF energy which is produced by a HF generator, the permitted frequencies for plastic welding machines are 13.56, 27.12 and 40.68 megahertz (MHz). The conveyor belt or other products need to be welded are fixed between two metal electrodes which is where the high frequency is supplied. As a result, the molecules in the material start to vibrate which generates heat and soften the material, and with the pressure supplied by the upper and bottom electrodes, the material will be fused together eventually. After cooling down, the weld seam can be as strong as the surrounding material. The four most important factors can affect the final weld result are Electrical Power, Pressure applied, Time of Welding and Cooling. These parameters should be adjusted according to different materials involved, different shapes, thickness and area to be welded. Also good quality molds and electrodes can improve the welding result significantly. Internal heating caused by the molecular movement is a natural advantage of High Frequency Welding. Unlike the other welding methods (such as laser, hot air and radiation heating), the energy or heat is supplied from the outside, which requires the heat to penetrate the material first in order to heat the contact surfaces, causes a risk of burning the top layer of the material. Welding speed is another great advantage of High Frequency welding technology, the materials are heated from the inside and the weld surface fuses within few seconds. And High Frequency welding is clean because the only material needed to produce is involved, there are no adhesives or any by-products needed in HF welding process.